Since the Google crack down on text link ad sales this month many in the blog related advertising industry have been scrambling to introduce new offerings. Text-Link-Ads.com (a TechCrunch sponsor) launched ShoppingAds.com this week, a nice looking CPC advertising system geared for blogs. New comer ScratchBack, led by well regarded online marketer Jim Kukral, offers an online “tipping” system. It allows a publisher to accept tips and “give back” links or images in return. Each listing has a unique message; when a visitor mouseovers a listing, a custom message shows up in the form of a bubbletip. 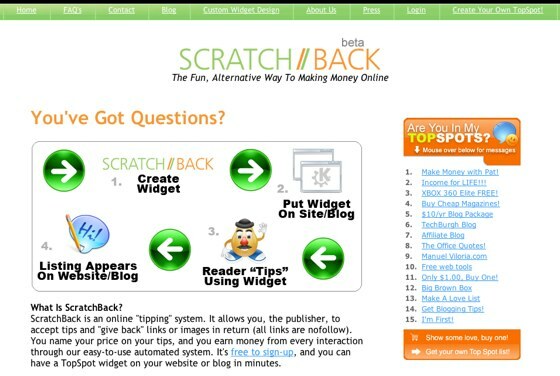 Publishers name their price on tips, and earn money from every interaction through the ScratchBack system. The service is free to signup, and publishers get the code for a “TopSpot” widget in minutes. ScatchBack will be taking a small cut from each transaction, although the percentage hasn’t been finalized. This isn’t a product for the top end of town, but it does provide a creative alternative to the many bloggers out there looking for new ways of making money.